What Tools Should a Writer Carry With Them? Our novels, short stories, and poetry all begin with a single idea. Sometimes this is a seed that develops over time, and occasionally (if we’re lucky) it’s a fully formed story that falls in our lap. Blog posts are the same. We may follow a theme, or we could be a random blogger who posts lifestyle tips or insights into quantum physics, either way the idea for each piece has to start somewhere. To confirm my theory, the idea of today’s post was sparked by my recent clumsiness in the local coffee shop. Occasionally I like to leave my four walls and be among people. Not in a pop-for-coffee-with-friends way (although I rarely say no to that! ), but in an I-need-background-noise kind of way. I’m sure there are many of you out there who know what I mean. Writing is a solitary affair, so you have to get your humanity fix from somewhere, and the local coffee shop works for me – aside from the fact that I am an avid fan of latte and a sticky bun. As I prepared to leave, after a therapeutic trip out and a large toasted tea cake, I lost my balance and dropped my handbag, almost taking the table and crockery with me. The contents of my bag spilled out far and wide, and I scrambled to the floor in a bid to collect my possessions – flashbacks of Tampax filled school bags haunting my every move. I’m sure that the assembled coffee-goers thought I was either an escaped teacher or a stationery kleptomaniac. As I hurried out of the shop, I was hit with a burning question – did every writers bag look the same as mine? Was I the only one to carry half of Paperchase with me on every outing? I write non-fiction and fantasy, so having various notebooks helps me cope with my Jekyll and Hyde writing moods. Does this work for everyone? It’s an unwritten rule that a writer is never without their notepad, but how true is this I wonder? My quest is to discover the truth. We’ve seen articles written that cover ‘Where I Write’, as well as ‘My Writing Desk’, but I’m interested in the battered leather bags, the satchels, and the rucksacks. 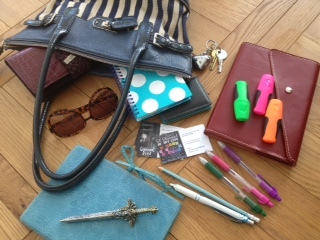 What lurks inside the bag of a blogger, the purse of a poet and the knapsack of a novelist? If you’re up for the quest, then share the contents of your bag and let’s see if the notepad rule is true. I really do not carry any tools around. Mind you, I seldom go out these days. So everything I use for writing, currently a tablet, at home. If I do have ideas, then they are stored in my noggin, like Nog. Thank you Shelley, for reading. My memory is not that good now. But I try to remember. Sometines I get through a whole scene in my head, dialogue as well. Then forget some or most of it. However, often enough will linger and I will write down what I can remember, nd fill in the gaps. I can understand thatShelley, closing rapidly on my 79th birthday, remembering some things is getting harder, though, not yet in my dotage, it is my apendages and spine etc that let me down. As mum wrnt with ALtzheimers, it can be worrying. This keyboard does not help. Its spelling is atrocious. Ideas are strange things. I think good ones give way if better ones come along. A pen and pad or an Ipad note is the way to jot them down. Have lost many over time, even when written down. Good luck. You’re not alone. Before I started blogging and writing seriously, my hand bag always contained my diary, my journal, my secret gratitude book, several scraps of paper with bits of stuff written on them (some I could never even understand) and a million pens! My handbag is still the same. But NOW I have my travel bag also!! My husband is beginning to query exactly what is in this Cath Kidson giant bag that weighs a ton! Where I go it’s gotta come with me. (We travel from east to west on a regular basis) I tried having all these note books and diaries on my phone/tablet but I hated it. I love my all little note books and there’s nothing nicer than the pen and paper! Haha..I used to carry business cards, red fountain pen, notebook, like a REAL writer. Now I mind my granddaughter I carry: snacks, hand gel, small toys and a spare nappy. C’est la vie! I have a strong carry bag, it contains the usual things, purse, sunglasses, tissues, lipstick and then a note book , two black pens, (they have to be Papermate Flexgrip otherwise I can’t write!) a brightly coloured folder containing a print out of my latest chapter, and a Costa coffee gift card. Often, I’ll carry a dog eared latest copy of Writing Magazine, and of course a novel of some description or my Kindle. The bag is heavy, and often I’ll go through it to see what I can ditch, which isn’t much, so I end up re-packing the same stuff. I too love to escape to the coffee shop. I like gel pens but my bags have become smaller. A good clear out is in order. I have to be dragged screaming to declutter, comes if not having syufg in the war and hanging on to everything. How soon we become used o carrying bags with ud. Did the Government really think we woukd shell out 5 ps that often? Another stupid mind-blowing idea that comes to nought! My bag contains so many writing notepads and pens!